VANCOUVER, British Columbia, Dec. 11, 2018 (GLOBE NEWSWIRE) -- AZINCOURT ENERGY CORP. (“Azincourt” or the “Company”) (TSX.V: AAZ, OTC: AZURF), is pleased to provide an update regarding its winter work program at the East Preston uranium project located in the southwestern Athabasca Basin, Saskatchewan, Canada. The Company has engaged Geotech Ltd to conduct a helicopter-borne Versatile Time-Domain Electromagnetic (VTEM™ Max) and Magnetic survey over the southeastern portion of the East Preston Project to complete survey coverage over the entire project area. The planned survey will consist of 498 line-km with 300m line spacing and 1,000m tie-line spacing – identical parameters to the previous VTEM™ Max survey, and ties directly into the previous flight lines (Figure 1). Flight lines are oriented NW-SE, perpendicular to the NE-SW trending structural and conductor trends of the basement rocks at East Preston. Geotech Ltd., the sole provider of the VTEM™ Max platform, has a system currently active in Saskatchewan and plans to commence the East Preston survey in mid-December. Weather permitting, the survey is expected to require 5-7 days, and will be completed by year end. “The VTEM™ Max system has been used in the Athabasca for many years and is an ideal technique for identifying basement conductor systems – the first-tier targeting criteria for unconformity uranium deposit discovery,” said Ted O’Connor, Director and Qualified Person on the East Preston project. 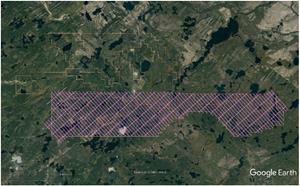 “VTEM has proven effective to depths of well over 400m in the Athabasca. The East Preston project lies outside the Basin with shallow targets anticipated, making VTEM™ Max an ideal direct targeting tool for the project, which may preclude the need for future ground-based EM techniques in this environment,” continued Mr. O’Connor. “This VTEM™ Max survey coverage will bring the entire East Preston project up to the same level of investigation,” said Alex Klenman, president & CEO. “It will allow us to generate additional quality geophysical drill targets and provide us with the ability to assess and evaluate the prospectivity of the entire project area. The value of the survey in terms of building our database on the project is critical. Last winter’s geophysical survey generated numerous high-priority drill targets that will be tested as part of the upcoming planned work program,” continued Mr. Klenman. The Company has applied for and is awaiting approval for drill permits at East Preston and once granted is planning to begin phase one of an approximate 10+ hole, 2000-2500-meter diamond drill program of inclined drill holes to test the structurally-controlled basement uranium deposit model. Drill targets have been prioritized based on stacking of airborne and ground electromagnetic and ground gravity geophysical data interpretation. Only one of the corridors has been drill tested to date, successfully intersecting structurally disrupted graphitic metasedimentary rocks and anomalous pathfinder elements (including uranium) at the Swoosh S6 target using a combination of Horizontal Loop EM (HLEM) and gravity as primary targeting tools. The work included 51.5 km of grid preparation (line cutting/picketing), 46.1 km of horizontal loop electromagnetic (HLEM), and 40.6 km of ground gravity along the previously known airborne helicopter VTEM conductive trends. Ground-truthing work confirmed the airborne conductive trends and more accurately located the conductor axes for future drill testing. The gravity survey identified areas along the conductors with a gravity low signature, which is often associated with alteration, fault/structural disruption and potentially, uranium mineralization. The combination/stacking of positive features will assist prioritizing targets for testing first. The technical information in this news release has been prepared in accordance with the Canadian regulatory requirements set out in National Instrument 43- 101 and reviewed on behalf of the company by Ted O’Connor, P.Geo. a director of Azincourt Energy Corp., as well as a qualified person. Azincourt Energy is a Canadian-based resource company specializing in the strategic acquisition, exploration and development of alternative energy/fuel projects, including uranium, lithium, and other critical clean energy elements. 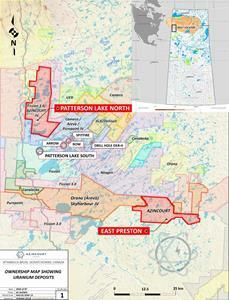 The Company is currently active at its joint venture lithium exploration projects in the Winnipeg River Pegmatite Field, Manitoba, Canada, its East Preston and Patterson Lake North uranium projects in the Athabasca Basin, Saskatchewan, Canada, and its 100% owned Escalera Group uranium-lithium project located on the Picotani Plateau in southeastern Peru. This press release includes “forward-looking statements”, including forecasts, estimates, expectations and objectives for future operations that are subject to a number of assumptions, risks and uncertainties, many of which are beyond the control of Azincourt. Investors are cautioned that any such statements are not guarantees of future performance and that actual results or developments may differ materially from those projected in the forward-looking statements. Such forward-looking information represents management’s best judgment based on information currently available. No forward-looking statement can be guaranteed and actual future results may vary materially.